Here in Ireland, most people are quite justifiably delighted to bid farewell to 2011. It may have been the worst in a sequence of difficult years for this country and its people. We continued to come to grips with the depth of our financial problems, but at last succumbed to stark reality and now must satisfy the demands of external stakeholders, namely the European Central Bank and the International Monetary Fund. For all of us who love the sport of politics, however, 2011 was action packed and memorable. A general election, a presidential election, votes on referendum questions and a wide array of other happenings were, if nothing else, a welcome distraction from the steady diet of economic doom and gloom that otherwise dominated the broadcast airwaves, the websites and the newspaper headlines. Following are my own top ten memories, and some reflections thereupon, from what was an extraordinary year in Irish politics. It came as a surprise to most onlookers on both sides of the border when the former Sinn Féin Westminster MP and Stormont MLA for West Belfast decided to walk away from Northern politics and lead his party’s charge in February’s general election in the Republic. The move was viewed disdainfully and derisively by the substantial segment of residents of the 26 counties who have no use for Sinn Féin’s politics, for the republican movement in general and for Gerry Adams personally. The commentariat was skeptical about Adams as a “southern politician,” given his woeful performance in a debate of small party leaders that took place in the run-up to the 2007 general election. Notwithstanding the suspicion about his pedigree and motives, the Sinn Féin president’s decision to run in the five seat Louth constituency proved a wise one. He easily topped the ticket and there is no question but that his candidacy helped Sinn Féin take an unprecedented 14 seats in Dáil Éireann. Since being elected, Adams has been a thorn in the coalition government’s side, with his most virulent criticism reserved for the Labour party. 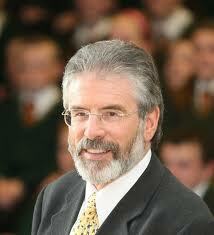 Sinn Féin will continue to fight it out with Labour for the hearts and minds of left of center Irish voters in 2012. First, Willie Penrose lost the party whip for defying the government’s decision to shutter the army barracks in his hometown of Mullingar, Co. Westmeath. Then, north Dublin TD Tommy Broughan voted against his party leadership on two separate procedural votes relating to the bailout of Irish financial institutions. And most recently, Patrick Nulty declined to vote for this year’s budget on the grounds that it failed to adequately protect the most vulnerable in society just weeks after winning a special election for the seat that had been held by the late Brian Lenihan Jr.
Labour’s leadership responded by expelling each TD from the parliamentary party. In Penrose’s case, the party stated that it couldn’t allow the “parish pump” to dictate government policy; Broughan, always on the party’s left flank and used to being in the wilderness, is regarded as sui generis; and Nulty has been deemed something of a traitor for so cavalierly bucking the party leadership so soon after relying on the party machinery for an election triumph. While these are all fair points, it is still somewhat vexing that an individual politician, whether he is acting in the best interests of his constituents or following his conscience, is deemed unfit to belong to a political party if his orthodoxy doesn’t extend to every single vote he casts in office. Others may lose the party whip in 2012, and the larger government party, Fine Gael, could see some of its own members defect in the wake of ever more challenging decisions to be taken in the next twelve months. The leadership of both parties is unlikely to make any concessions because of the huge majority they enjoy in the Dáil. An extraordinary number of candidates sought election to Dáil Éireann in February’s general election. 566 candidates, fully 100 more than in the 2007 general election, campaigned for seats in the parliament, including an unprecedented 233 independents. Independent, in spite of their relative lack of resources as compared to their major party opponents, fared extremely well in the election. 17 independents, from across the political spectrum, won election. Since then, they have been a formidable and visible presence in Dáil Éireann. From their non-conformist clothing and approach to the technical grouping they have formed to make their voices heard, independents in the current Dáil cannot be ignored. Free from the constraints of the party whip, left-leaning independent TDs are holding Labour’s feet to the fire on what they call punitive elements of the budget and those on the right are questioning what they term Fine Gael’s unquestioning acceptance of the dictates of the European Central Bank and the International Monetary Fund. Love them or hate them, independent TDs will continue to hold the government parties to account until the next general election. Referendums on two questions to amend the Irish Constitution – one on judges’ pay and another on extending powers of parliamentary inquiry – were put to voters on October 27th, the same day as the presidential election. The first referendum was passed by a large majority of Irish voters and explicitly allows for the pay of members of the judiciary to be reduced. The second, which would have allocated quasi-judicial power to committees of the Houses of the Oireachtas (Dáil and Seanad Éireann) to investigate individuals in the course of parliamentary inquiries and to determine whether or not their inquiries accorded with due process principles, was defeated. The political classes and most observers were taken aback by the result of the vote on the 30th Amendment. The consensus was that the anger at the legal profession, and judges in particular, that polls showed were motivating so many voters on the 29th Amendment, would be enough to get the 30th Amendment passed too. The reality is that two crucial factors combined to fuel a “No” vote in the end, however. First, many voters did not understand what they were voting on and chose to reject the amendment as a result. Second, consistent, reasoned criticism of the measure by recognized constitutional experts, together with a high profile, last minute campaign organized by the Irish Council for Civil Liberties warning of the dangers of “kangaroo courts” that might be more concerned with potential political gain than with time-honored legal safeguards, helped to plant seeds of doubt in the minds of many voters. Cynics might conclude that, as much as Irish people distrust lawyers, they distrust politicians even more. As bad as 2010 was for former Taoiseach Brian Cowen, the first two months of 2011 were even worse. Badly wounded by a radio interview in which he sounded much the worse for wear after a Fianna Fáil party “think-in” in Galway and by revelations of a day spent at a golf club with former Anglo Irish Bank head Sean Fitzpatrick in the summer of 2008, Cowen entered 2011 under serious pressure from his party colleagues. He survived a confidence vote in January, but Foreign Minister Micheál Martin declined to support Cowen’s leadership and lost the party whip. Desperate to turn things around, Cowen attempted a reshuffle of cabinet ministers. This proved an unmitigated disaster and prompted Fianna Fáil’s governing partner, the Green Party, to withdraw its support. Ultimately, Cowen resigned as leader of Fianna Fáil and was replaced as party leader by Micheál Martin, who led the party into the general election. Cowen did not seek re-election to the Dáil. Since then, Brian Cowen’s rise within Fianna Fáil and his disastrous tenure as Taoiseach have been scrutinized in sometimes excruciating detail. In many ways a prototypical “old Fianna Fáil” politician for whom loyalty to the party was paramount, Cowen, by all accounts a very bright and engaging man, simply was not up to the monumental task of leading Ireland in this profoundly challenging time. That he was not, however, does not make him a bad man, or someone who doesn’t love his country. Some of the attacks on Brian Cowen – there have even been quite despicable attacks on his wife and children as they go about their own business – since he left public life have been unfair in the extreme. It’s hard not to feel bad for the former Taoiseach. He was the wrong person at the wrong time, and the history books are unlikely to be kind to him. Former Taoiseach Bertie Ahern’s once secure and proud place in the history books was further dislodged in 2011. As more and more digging is undertaken by journalists and as more and more detail emerges of his time in public life, ever fewer Irish people still hold the “Teflon Taoiseach” in high esteem. With good reason, Bertie Ahern will always be highly regarded internationally for his indefatigable work to help end conflict in Northern Ireland. As many present during the negotiations over the Good Friday Agreement and at other important junctures of the peace process have repeatedly recalled, Bertie Ahern’s skill and tact were indispensable to the successful outcome. But very few Irish people still believe that Ahern, as his country’s leader during a period of incredible prosperity, was either squeaky clean or a statesman. On the morning on the day after February’s general election, media reports based on early vote tallies at count centers around Dublin indicated that Fianna Fáil might not have a single TD in the capital. As it turned out, the late Brian Lenihan Jr. held his seat, but it was the worst showing in Dublin by far for the party that has dominated Irish politics since the foundation of the state. The party was eviscerated all across the country and won just 20 seats. A number of long time stalwarts were defeated and it failed to win seats in many of its traditional strongholds. This electoral implosion can be attributed first and foremost to the economic collapse, but also to various allegations of corruption and mismanagement of the economy and to a rapidly formed antipathy to all things Fianna Fáil. The party brand is now toxic and the question for 2012 is whether Fianna Fáil is finished? The performance of its young candidate in the Dublin West special election, David McGuinness, gave the party some hope. McGuinness finished a stronger than expected second to Labour’s Patrick Nulty. And Fianna Fáil’s chances of political survival largely rest on the next generation. If a new generation of activists and office seekers can be found and can articulate the uniquely Irish values that always underpinned the party’s message and appealed so broadly to urban and rural voters alike, Fianna Fáil may come back eventually. But the party brand has become highly toxic and, despite the efforts of Éamon Ó Cuív and other current office holders to adopt a different course immediately, the monumental task of rebuilding a viable political entity won’t happen overnight. Enda Kenny led Fine Gael into this year’s noteworthy general election triumph. It was a great vindication of his leadership personally, given that he was the subject of a leadership challenge in 2010. 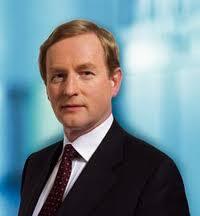 A Mayo-based TD since the death of his father, the sitting TD, in 1975, Kenny has been the Fine Gael leader since 2002. He became Taoiseach amidst great fanfare and ably represented Ireland during the historic visit of Queen Elizabeth II and the inspiring visit of President Barack Obama. This summer, after the publication of the Cloyne Report, which detailed the investigation into more allegations of child sexual abuse by Catholic priests, Kenny gave an historic address in which he ripped the Vatican for its demonstrated pattern of obfuscation and stated that “the historic relationship between church and state in Ireland could not be the same again.” The speech itself was historic and may have marked the most pointed criticism of the Vatican ever offered publicly by an Irish elected official. Enda Kenny indicated in December’s “state of the nation” address that things will remain difficult for Ireland and the Irish people in 2012. Only time will tell how long the Irish people will give him and his government to improve matters. After a campaign that was unprecedented for its unpredictability, the 70 year old Labour party president and Galway man, Michael D. Higgins, was elected the ninth President of Ireland. While at least two other candidates, Senator David Norris and businessman Seán Gallagher, topped the opinion polls at various stages of the campaign, Michael D. stayed strong and steady throughout and won the only poll that mattered on the 27th of October. He plans to be a president of all the Irish people, including the many recent immigrants to Ireland, to “renew the republic” and to use the presidency at home and abroad to celebrate all that is great about this country and its people. He had wanted to be president for some time and saw off a spirited challenge from two Labour party colleagues to earn his party’s nomination. He has long been a hero to those on the political left for his human rights activism and willingness to fight for unpopular causes; to those living in Ireland’s Gaeltacht (Irish speaking) areas for his work to found the Irish language television station, TG 4, as a government minister in the 1990s; and to virtually all Irish people for his engaging, intellectual and quirky public persona. It will be interesting to see how he engages with world leaders of whom he has been critical in the past, perhaps most especially President Barack Obama and Prime Minister Benjamin Netanyahu. 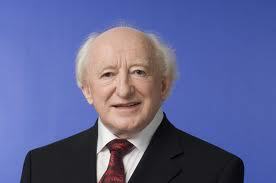 In the numerous debates among the presidential candidates, Michael D. demonstrated a comprehensive understanding of the powers of the presidency and the nature of the presidential role. He was, in the eyes of most onlookers, the clear winner of each and every debate that was held and his performances played no small role in his ultimate victory. Notwithstanding his extensive prior involvement with Fianna Fáil, his mixed fortunes as an entrepreneur and businessman and his relatively unknown past, Seán Gallagher was the choice of 39% of the Irish electorate just five days before Election Day and the clear favorite to be Ireland’s ninth president. His relentlessly positive message and youthful exuberance definitely resonated with a significant segment of the electorate. However, everything changed in the last presidential debate three days before the election. In the debate, Sinn Féin’s presidential candidate, Martin McGuinness, accused Gallagher of accepting a €5,000 donation in advance of a Fianna Fáil fundraiser from a South Armagh-based businessman. Gallagher was visibly flummoxed by the accusation, by the reaction of the studio audience and by a later discredited tweet to the effect that Sinn Féin would produce the businessman the following day. He even made the colossal error of using the word “envelope” – synonymous with political corruption in Ireland – as he fumbled to explain himself. It was gripping and unforgettable viewing. And it changed Irish history. Set to win the presidency in just three days, Gallagher’s inability to respond to McGuinness’s accusation and to put forward a reasonable explanation for his actions ruined his campaign. It all happened in minutes. It proved that debates matter. And it proved that experience matters. Seán Gallagher, an untested political neophyte, wasn’t prepared for an allegation that he should have known was coming and wasn’t capable of rolling with the punches when put to the test. A few minutes of one debate cost him the presidency. That’s it for 2011, an extraordinary year in Irish politics. 2012 promises more austerity and trying times as Ireland continues on a path that will hopefully lead to recovery. That will undoubtedly produce more political drama and this column will analyze it all very carefully. Things are likely to be even more dramatic next year in the United States as President Barack Obama seeks another term. This column will also examine the campaign for the White House and for control of Capitol Hill. But for now, here’s hoping that all Irish Central staff and readers – especially those who edit and read this column – have enjoyed a very merry Christmas. And here’s hoping that everyone on both sides of the Atlantic will have a happy, healthy and more prosperous 2012.